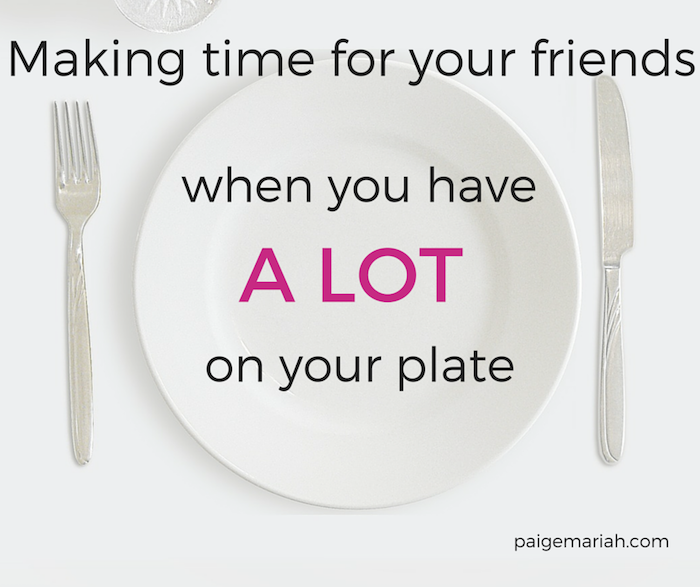 making time for friends when you have A LOT on your plate! It seemed so much easier to make time for friends while in school! You had classes with them, went to campus events together, and sometimes were even in the same organizations. Now that I’m working full time and trying to balance all of the demands of the adult life…it can be a little more difficult to make time for all of my friends. Friendships take effort just like any other relationship and they are definitely a worthy investment of time. Therefore, I decided to get a little creative! Here are a few of the ways that I’m still able to make time for my friends, even with a lot on my plate. Share a Hobby: Your favorite hobby is something that you already enjoy doing, so why not enjoy it with a friend? Dancing, jewelry making, baking…we all already have those things that we’re sure to make time for- invite a friend to join you! Blogging is one of my most loved hobbies, so I’m always inviting my friends to come along to blogger events with me. A couple of them have even begun to enjoy it so much that they’ve started their own blogs too! Exercise: Exercise is a vital part of maintaining good health. I’ve been able to spend a lot more time with my friends by making them my gym buddies! We attend classes like spin and bootcamp together, allowing us to get fit and hang out at the same time. Dedicate a Day: Keeping up with your friends sometimes takes a little extra planning. Schedule a specific day that is always dedicated to seeing your friends. Maybe you all can have Brunch Sundays or TGIT wine nights..to enjoy whatever Shonda Rhimes has up her sleeve together! Travel: Of course this is my favorite way to spend time with girls! We have so much fun planning trips months ahead of time and counting down until the date. Though we may not see each other every day, we can look forward to having back to back days of fun together on whatever beach we choose for vacation! What's another way that you make time for your friends? Share in the comments! UUUGGG, we thought when our kids were young adults, as they are now, that we'd all have more time to get together but we're still all busy as heck. I guess that's a good thing but my friends and I - the ones I've had since grammar school - only get together twice a year. Thanks for the reminder that we really need to get together more often, Paige.